KSTP-AM, Minneapolis Re-Brands as ‘SKOR North.’ Tomorrow (1/15) will be sports talk KSTP-AM’s first day as “SKOR North” as it shucks the “1500 ESPN” brand. Hubbard Radio says in a press release that the brand is now “a digital-first sports brand that will create and distribute content across multiple traditional and digital platforms, including 1500 AM, 94.5 FM HD2, streaming, a dedicated SKOR North app, podcasts, Facebook, Twitter, Instagram, and YouTube.” In September, Hubbard dropped the “Garage Logic” show with host Joe Soucheray from the lineup, as well as Patrick Reusse’s show (PD Brad Lane exited as well). The new program schedule will still consist of ESPN Radio’s “Golic & Wingo” in morning drive, followed by the “Dan Le Batard with Stugotz” show. Local afternoon program includes the new “SKOR North Live with Matthew Coller,” followed by the drive time “[Phil] Mackie and Judd [Zulgad] Show with Ramie,” and a return to the airwaves of Patrick Reusse as one of the four 6:00 pm to 7:00 pm programs that will rotate throughout the year, depending on the season. Monday Memo: CES 2019. Consultant Holland Cooke’s Monday Memo here at TALKERS magazine summarizes some of his takeaways from last week’s enormous CES 2019 in Las Vegas. Cooke reports that Consumer Technology Association vice president of market research Steve Koenig says we’re at the beginning of the “Data Age of Consumer Tech” and that means, “information about our listeners – whom advertisers want as customers – is gold.” See his entire report here. WICC, Bridgeport Announces Programming News. Connecticut news/talk WICC-AM, Bridgeport announces it will continue to serve as an affiliate for New York Yankees baseball. In addition, the Cumulus Media station is adding FOX News Radio’s Brian Kilmeade show for the 10:00 am to 1:00 pm slot. It also is carrying Westwood One’s Ben Shapiro in the 10:00 pm to 12:00 midnight daypart. Mike Rich to Lead Townsquare Media Danbury. Radio management pro Mike Rich is named market president and chief revenue officer for Townsquare Media’s Danbury, Connecticut group of sports talk WINE-AM “Sports Radio 940,” rock WRKI-FM “i95,” and WDBY-FM “Kicks 105.5.” Rich comes to Townsquare from his most recent position as CEO of digital media firm Irish Studio. He’s also served with Time Inc., Radio One, and AOL. TALKERS News Notes. Albuquerque news/talk KKOB-AM’s new afternoon drive personality – former, longtime rock KZRR “94 Rock” morning personality T.J. Trout – is an unabashed “left of center,” “social liberal” who will take over 3:00 pm to 6:00 pm program on Cumulus Media’s conservative news/talk station on January 22. Trout talks about getting the gig and how he views his role on the station in a piece with Albuquerque Journal here…..The podcast “Red Pilled America” – an iHeartRadio original podcast – got some love from The Washington Times recently in an article about story-focused podcasts that target conservative listeners. The podcast is the work of husband and wife creative duo Patrick Courrielche and Adryana Cortez and the piece delves into how the program highlights stories rather than monologues to get the message across to listeners…..The NHL’s Boston Bruins and the Boston Bruins Foundation are holding the second annual Patrice Bergeron & 98.5 The Sports Hub’s Pucks & Paddles event on Thursday, February 7. The table tennis tournament will feature players from the active Boston Bruins roster, on-air personalities from Beasley Media Group’s sports talk WBZ-FM “98.5 The Sports Hub,” and patients from Floating Hospital for Children at Tufts Medical Center with all proceeds to benefit the hospital…..Beasley Media Group announces Jennifer Sulik is named to the newly created position of vice president of strategic partnerships at Beasley XP, the company’s esports division. Sulik was most recently founder and chief executive officer of Go Media Detroit, a digital media advertising agency. Previously, she worked in the digital sales division at WXYZ-TV, Detroit and UBM Tech in San Francisco, where she developed integrated business-to-business media campaigns targeting game developers and game industry influencers, including Game Developer Magazine, Gamasutra.com and Indiegames.com…..Across the pond, “Fix Radio” – the station for builders and tradespeople – will launch in Manchester, England today (1/14). Fix Radio is programmed by British talk radio pro Graham Mack and is based in London. Mack and Gaz Drinkwater present the daily morning show on the format. The Trump-Putin Relationship, U.S.-Mexico Border Wall, Government Shutdown, Jayme Closs Case, Paris Bakery Bombing, Bezos Divorce, 2020 Presidential Race, Dems in Puerto Rico, Winter Snow Storm, and NFL Playoffs Among Top News/Talk Stories Over the Weekend. Reaction to weekend stories indicating the FBI was concerned about President Trump’s relationship with Russia’s Vladimir Putin; the battle over funding for a wall on the U.S.-Mexico border; the ongoing government shutdown; missing teen Jayme Closs is found after escaping her captor; the deadly bombing at a bakery in Paris; the divorce of Amazon founder Jeff Bezos; potential presidential candidates in the 2020 election; Democrat legislators are criticized for “partying” in Puerto Rico with lobbyists; the winter storm that swept across the Midwest to the Mid-Atlantic; and the weekend’s NFL playoff action were some of the most-talked-about stories on news/talk radio over the weekend according to ongoing research from TALKER magazine. Music Radio News and Career Moves. Programming pro Terri Avery is the new PD at Cox Media Group’s urban contemporary WALR, Atlanta “Kiss 104.1,” effective January 22. Avery was most recently radio station manager and an instructor at Carolina School of Broadcasting in Charlotte. Prior to that, she was OM/PD at WPEG and WBAV in Charlotte for 14 years. CMG Atlanta director of operations Chris Eagan says, “Terri is well-regarded in the radio industry. She is smart, engaging, a champion in talent coaching and an expert in urban AC. Her years of diverse experience make her a great addition to the ‘Kiss 104.1’ team.”…..Cumulus Media rock KSAN, San Francisco “107.7 The Bone” officially names Chasta Michaelis midday personality. She’s been interim host of the daypart since Steven “The Weedman” Seaweed in 2017. 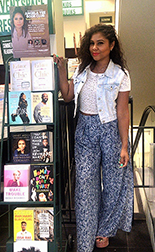 Chasta also serves as a cast member on the station’s “Lamont& Tonelli Morning Show,” a role she will continue along with her daily production of her daily Facebook Live chats from “The Bone” studios following each morning show…..Through a partnership between iHeartMedia and LiveXLive Media Inc – a global digital media company focused on live entertainment – the 2019 iHeartRadio ALTer Ego concert at the Forum in Los Angeles on January 19 – will stream live. LiveXLive chairman and CEO Rob Ellin comments, “Our mission is to bring our global audience of music fans the ‘best seat in the house’ for musically diverse concerts by the most popular artists. iHeartMedia, with its massive reach across radio, digital and social, and its culture-defining marquee events such as ALTer Ego, is undeniably a perfect fit.”…..According to a report by Chicago media maven Robert Feder, the “Rock ‘n’ Roll Roots” show with Bob Stroud that’s heard weekly on Hubbard Radio’s classic rock WDRV “97.1 The Drive” is getting another play. The show has been airing Sunday mornings from 7:00 am to 10:00 am but, as program director Rob Cressman says, “The ‘Stroud Crowd’ has been relentless in their quest to get ‘Roots’ scheduled a bit later in the day.” So, now the show also airs from 7:00 pm to 10:00 pm…..Kelly J moves from evening jock to a member of the Jeff Pope morning show on All Pro Broadcasting’s hot AC KHTI, Riverside-San Bernardino…..Condolences to the family and friends of radio personality Michael “Mike” Walker, who died on January 7 at the age of 60. Walker worked at numerous radio stations during his career, including WIFM, Elkin; WKBC North Wilkesboro; and WWWC, Wilkesboro in North Carolina. He was the founder/operator of The Production Room where he produced and voiced more than 530 weekly episodes of the syndicated “Saving the 70s” show that focused on 1970s music and pop culture. PPM Analysis: Contemporary Christian. TALKERS magazine managing editor Mike Kinosian presents a look at the performances of radio stations based on data from Nielsen Audio’s December 2018 PPM survey, today focusing on contemporary Christian. See the report here. Dave Tepper to Program KKSE, Denver. Sports talk KKSE, Denver “Altitude AM 950” is owned by Kroenke Sports and Entertainment – a company run by Stan Kroenke and family – that owns the NBA’s Denver Nuggets and the NHL’s Colorado Avalanche. The station announces that sports radio pro Dave Tepper is named the new program director for the station, effective August 15. KSE Radio SVP and general manager Brenda Egger comments, “We were fortunate to have many outstanding candidates for this position but Dave’s confidence, winning track record, play-by-play experience, and team relations truly stood out from the others. Dave brings a wealth of experience and knowledge to KKSE and I am confident that he will be an incredible asset to our team.” Tepper was most recently operations manager at NRG Media’s Omaha cluster. Brent Johnson Exits Cumulus’ Columbia South Carolina Cluster. Air personality Brent Johnson was the morning host on Cumulus Media’s hot AC WTCB, Columbia, South Carolina and hosted a daily sports talk show on sister WNKT “107.5 The Game.” The State reports that after learning of coming programming changes at the cluster, Johnson chose to leave the company. He will continue to be part of University of South Carolina football coverage this season on WNKT as the games are produced by rights holder IMG. Cumulus Columbia VP and market manager Rick Prusator tells The State that Johnson was not fired nor was he forced out. Johnson announced his exit on social media but offered no reason for his departure. Indy Sales Pro Brian Harrington Joins iHM’s ‘FOX Sports 97.5 FM/1260 AM’ and ‘Real 98.3.’ Indianapolis media sales pro Brian Harrington is appointed general sales manager for iHeartMedia’s sports talk WNDE-AM/W248AW “FOX sports 97.5/1260 AM” and hip hop WZRL “Real 98.3.” iHeartMedia Indianapolis market president Brett Beshore says, “We couldn’t be more excited to have Brian bring his 20-plus years of sales and management experience to our iHeartMedia Indianapolis team. His experience, knowledge of the community, reputation, and passion for the radio business make him the perfect choice to lead our WZRL and WNDE sales teams.” Harrington was most recently an account executive with Woof Boom Radio. He’s also served in the market in several capacities with Radio One. Lotus Spins Off Tucson News/Talk KQTH-FM to Family Life Broadcasting; KTGV-FM Goes to Bustos Media. In order to comply with FCC station ownership caps relative to its purchase of the Tucson and Boise radio clusters of E.W. Scripps for $8 million, Lotus Communications is agreeing to sell news/talk KQTH-FM, Tucson to not-for-profit Family Life Broadcasting and rhythmic oldies KTGV-FM to Bustos Media for as-yet undisclosed sums. Dr. Randy Carlson’s Family Life Broadcasting operates religious stations and is expected to flip KQTH from news/talk to a religious format. Currently, Mike Rapp hosts the only local daily program on the station — the “Tucson’s Morning News” show. Kalil & Co. is the exclusive broker for both deals. Gallagher and Elder Host Listener Cruise. 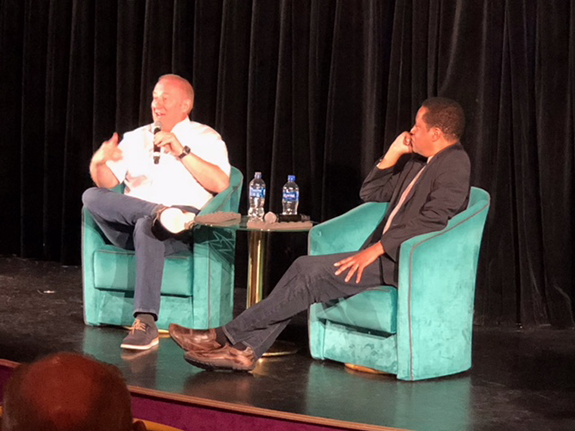 Pictured above are Salem Radio Network hosts Mike Gallagher (left) and Larry Elder (right) in the theater aboard the cruise ship Pride of America as they guide Salem Radio Network listeners on a tour of the Hawaiian Islands. In the photo, the two are participating in a discussion of the 2018 midterm elections. Trump-Russia Investigation, Omarosa White House Recording, DC White Nationalist Rally, Paul Manafort Trial, Sea-Tac Plane Theft, Keith Ellison Allegations, Trump Trade War, Blackkklansman and The Meg Films, NFL Pre-season, and MLB Action Among Top News/Talk Stories Over the Weekend. The Robert Mueller-led investigation into possible connections between Trump campaign operatives and Russia agents; the controversy over Omarosa Manigault Newman’s release of a recording purported to be her firing by John Kelly; Sunday’s Washington rally of White Nationalists; the trial of former Trump campaign manager Paul Manafort on fraud charges; the theft and crashing of a commercial jet by a ground worker at Sea-Tac airport; the allegations of physical abuse against Minnesota Democrat Keith Ellison; the Trump tariffs and concerns about the effects of trade wars; the films Blackkklansman and The Meg; the NFL’s pre-season action; and Major League Baseball action were some of the most-talked-about stories on news/talk radio over the weekend, according to ongoing research from TALKERS magazine. Music Radio News and Career Moves. In San Diego, Hilary Doneux is promoted to assistant program director at Local Media San Diego’s alternative XETRA-FM “91X.” Doneux is also music director and host of the 10:00 am to 3:00 pm show. She says, “To say I’m excited is an understatement. ‘91X’ is my radio home and I feel ridiculously lucky that I get to continue to grow with such an incredible team. I’m so grateful to Garett Michaels for having faith in me and sharing his knowledge (and snacks), and to [VP/GM] Gregg Wolfson, for this opportunity!”…..On-air pro Shawn Quinn exits the afternoon drive show at Cumulus Media’s alternative KCJK, Kansas city “X105.1.” Quinn had been the morning host at the station until Premiere Network’s “The Woody Show” was added to the program schedule…..Air personality Jahna Michal is named co-host of the morning show at Townsquare Media’s country WPUR, Atlantic City “Cat Country 107.3.” She joins station brand manager and morning drive host Joe Kelly for “The Cat Country Morning Show with Joe and Jahna.”…..Pictured at right is WWPR, New York-based “The Breakfast Club” morning show personality Angela Yee standing next to the in-store display promoting her popular book club, Kickin’ It from The Stoop (#KIFTS) at Barnes & Noble’s flagship store on 5th Avenue in New York City. Yee hosts the book club along with friends Tasha Hilton and Tony Forte monthly at WOODStack Ivy in Brooklyn. The gathering is also broadcast on Facebook Live via Yee’s page. Takeaways from July PPM – Round One. Below are managing editor Mike Kinosian‘s Twelve Takeaways from Nielsen Audio‘s July 2018 PPM ratings survey. The first report includes the 12 markets of New York, Los Angeles, Chicago, San Francisco, Dallas, Houston, Atlanta, Philadelphia, Nassau-Suffolk (Long Island), Riverside, San Jose, and Middlesex-Somerset-Union (New Jersey). Nielsen’s July 2018 survey period covered June 21 – July 18. See all the 6+ numbers from subscribing stations here. Spoken-Word Formats – As a result of being a combined -2.0 in four consecutive decreases (6.2 – 5.5 – 5.0 – 4.8 – 4.2, 6+), Entercom all-news WINS drops from fifth to seventh. On the flipside, co-owned/similarly-formatted WCBS-AM adds two-tenths to 2.7 (#14 to #13, 6+), pulling the plug on three successive down or flat sweeps that accounted for a loss of eight-tenths (3.3 – 2.9 – 2.7 – 2.5, 6+). Their sports talk sibling, WFAN “Sports Radio,” regains the three-tenths it lost in June (4.7 – 4.4 – 4.7, seventh to sixth, 6+); 4.7 in May and July is its best 6+-showing since 5.2 in November 2017. The Yankees’ flagship logged back-to-back gains of +.8 (3.1 – 3.9 – 4.7, March – April – May, 6+). Following five survey periods in a row without an increase resulting in a nearly 50% loss (-2.5) of its 6+-share (5.2 – 5.2 – 3.9 – 3.5 – 3.3 – 2.7, 6+), WFAN picked up four-tenths in March. Meanwhile, the key station of the Mets – iHeartMedia news/talk WOR – is off for the third straight time for a collective loss of seven-tenths (2.5 – 2.1 – 2.0 – 1.8, #19 to #20, 6+); “710 The Voice of New York” was +.6 in April. A March gain of one-tenth ended five straight down or flat reports for a -.4 (2.2 – 2.2 – 2.0 – 1.8 – 1.8 – 1.8, 6+). Stuck on 1.7 (6+) in May and June, WEPN “98.7 ESPN New York” falters three-tenths to 1.4 (6+) but remains at #21. When WEPN picked up two-tenths in February, it halted three downward moves in succession that produced a loss of seven-tenths (1.8 – 1.4 – 1.2 – 1.1, 6+). The last 15 New York City (6+) trends for Townsquare Media’s news/talk WKXW “New Jersey 101.5” (flat at #23) are: 1.1 – 1.0 – 1.1 – 1.1 – 1.1 – 1.1 – 1.0 – 1.0 – 1.1 – 1.1 – 1.2 – 1.1 – 1.1 – 1.1 – 1.1. Two-tenths behind it is Cumulus Media news/talk WABC, which is without an increase for the fifth consecutive sweep (1.2 – 1.2 – 1.1 – 1.1 – 1.0 – .9, flat at #24, 6+). In the public news/talk arena, WNYC Broadcasting Foundation’s WNYC-FM is a combined -.7 in May, June, and July (3.4 – 3.0 – 2.7 – 2.7, #12 to #13, 6+), while co-owned WNYC-AM is flat at .5 (#30 to #29, 6+). New York City Music Formats – Without a loss for the fifth sweep in a row for a +1.0, (1.6 – 1.7 – 1.9 – 1.9 – 1.9 – 2.6 , 6+), Univision Radio Spanish contemporary WXNY “X-96.3” advances from #20 – #16. This (2.6) is its best 6+-showing since May 2017’s 2.8. Moreover, it overtakes Spanish Broadcasting System’s similarly-formatted WPAT-FM “Amor 93.1” (2.6 – 2.5, -.1, #13 to #17, 6+) for the first time since November 2017 when “X-96.3” held a 2.1 (6+) to 2.0 (6+) advantage over “Amor 93.1.” When WPAT-FM dropped four-tenths in June, it snapped at three its consecutive string of up or flat trends that produced a +.3 (2.7 – 2.7 – 2.8 – 3.0, 6+). Vaulting from #17 to #12, Entercom-owned WNYL “Alt 92.3 – New York’s New Alternative” notches its third uptick in a row for a combined +.9 (1.9 – 2.0 – 2.3 – 2.8, 6+). Conversely, iHeartMedia adult contemporary WLTW logs its third setback in succession that has accounted for an overall -1.6 (8.5 – 7.7 – 7.3 – 6.9, 6+). Nonetheless, “106.7 Lite FM” remains at #1 for the 12th successive sweep. The last time WLTW fell below a six-share (6+) was in October 2017 (6.6). A collective +7.1 in five consecutive gains (6.0 – 6.1 – 6.6 – 7.0 – 8.8 – 13.1, 6+), WLTW was -5.1 in January and February (13.1 – 8.5 – 8.0, 6+) but rebounded in March and April with a +.5 (8.0 – 8.4 – 8.5, 6+). Entering the June 2018 ratings period, WBLS “#1 for R&B” had posted a 5.7 (6+) in four of the previous six survey periods (5.7 – 5.4 – 5.7 – 5.9 – 5.7 – 5.7, 6+). While the Emmis urban AC improved by four-tenths in June, it sputtered by twice that margin in July, slipping from second to third (6.1 – 5.3, -.8, 6+). After posting four straight (modest) gains for an overall boost of one-half share (3.5 – 3.6 – 3.7 – 3.9 – 4.0, 6+), rhythmic CHR sibling WQHT “Hot 97 – #1 for Hip-Hop” drops one-tenth to 3.9 (eighth to ninth, 6+). Meanwhile, iHeartMedia’s similarly-formatted WKTU “103.5 The Beat of New York” is up or flat for the fourth time in succession (3.4 – 3.4 – 3.6 – 3.6 – 3.6, 6+), but backslides from #10 to #11. Unchanged at #8, iHeartMedia-owned WAXQ “Q-104.3 New York’s Classic Rock,” which was off a collective eight-tenths in four straight down or flat trends (4.8 – 4.4 – 4.1 – 4.1 – 4.0, 6+), adds one-tenth to 4.1 (6+). Its urban contemporary sibling, WWPR, continues a down/up pattern that began in December 2017 (3.9 – 3.2 – 3.5 – 3.3 – 3.4 – 3.3 – 3.6 – 3.4 – 3.8, 6+) as “Power 105.1” returns to the top ten (#11 to #10). Following four straight down or flat trends that accounted for a combined loss of six-tenths (3.0 – 2.7 – 2.4 – 2.4 – 2.4, 6+), Entercom hot AC WNEW adds three-tenths to 2.7 (6+) as “Fresh 102.7” moves from #16 to a three-way tie at #13. Another streak that ends in July involves Cumulus country WNSH “94.7 Nash FM,” which loses one-tenth to 2.4 (#14 to #18, 6+), thus curtailing three positive spikes in a row for an overall gain of six-tenths (1.9 – 2.0 – 2.2 – 2.5, 6+). Spoken-Word Formats – Ever consistent, iHeartMedia news/talk KFI records a 4.1 (6+) for the third time in the last four sweeps (4.1 – 4.4 – 4.1 – 4.1), as “AM 640” continues in sixth-place. When KFI dipped by two-tenths in “Holiday” 2017, it ended at six a consecutive string of up or flat trends that netted a collective eight-tenths (3.3 – 3.4 – 3.5 – 3.5 – 3.9 – 4.1 – 4.1, 6+). In an alternating 2.6 – 2.7 – 2.6 – 2.7 pattern (April – May – June – July, 6+), Entercom’s KNX “1070 News Radio” moves from #12 to a three-way scrum at #11; KNX was off six-tenths in April. Although perhaps not quite as pronounced as the KNX situation, the last five topline (6+) stats for Pasadena City College news/talk KPCC “The Voice of Southern California” are 2.7 – 2.6 – 2.7 – 2.7 – 2.5 (#10 to #15, 6+). 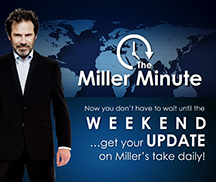 Up two-tenths in consecutive monthlies (.9 – 1.1 – 1.3, 6+), Salem Media Group news/talk KRLA “AM 870 The Answer” progresses from #29 to #27. Close behind are sports talk KSPN “710 ESPN,” up by one-tenth in three straight sweeps (.9 – 1.0 – 1.1 – 1.2, #29 to #30) and iHeartMedia-owned Los Angeles Dodgers flagship KLAC “AM 570 LA Sports,” which nearly triples its 6+-stat (+.7) through six successive sweeps without a loss (.4 – .4 – .5 – .9 – .9 – 1.1 – 1.1, unchanged at #31, 6+). Co-owned news/talk KEIB “AM 1150 The Patriot” is up one-tenth in June and July (.8 – .9 – 1.0, #33, 6+), while Cumulus Media-owned KABC “790 News-Talk-Evolved” is flat at .4 and remains at #41 (6+). Los Angeles Music Formats – The top eight July 2018 finishers in the “City of Angels” are either down or flat from June 2018. There has been quite a turn in the market’s alternative battle as Entercom-owned KROQ is a combined +.6 in five straight up or flat trends (2.2 – 2.2 – 2.3 – 2.4 – 2.5 – 2.8, 6+), rocketing from #17 to #10. Contrast that to its format foe, iHeartMedia’s KYSR-FM “Alt 98.7 – LA’s New Alternative,” which is off a combined seven-tenths in June and July (3.2 – 2.8 – 2.5, 6+), spiraling out of the top ten (#9 to #15). For the fourth time in the last five survey periods and fifth time since March, KYSR hot AC cluster-mate KBIG “104.3 My-FM” registers a 5.7 (6+) and is #1 for the third straight sweep (5.7 – 5.7 – 5.7 – 5.8 – 5.7, 6+). Even though “My-FM” is off one-tenth, it widens the lead over runner-up and adult contemporary sibling KOST “Coast 103.5” (5.6 – 5.2, -.4, unchanged at #2, 6+) from two-tenths to one-half share. Having lost more than half (-6.6) of its 6+-stat in consecutive surveys since the “Holiday” 2017 report (11.9 – 5.5 – 5.3, 6+), KOST bounced back in March and April with a combined +.7 (5.3 – 5.9 – 6.0, 6+). Over the past 35 Los Angeles sweeps dating back to December 2015, KOST and KBIG have had a stranglehold on the #1 position. “Coast 103.5” has been on top 20 times (December 2015 through January 2017; December 2017; “Holiday” 2017; March 2018; and April 2018), while “My-FM” has set the pace on 15 occasions (February 2017 through November 2017; January 2018; February 2018; May 2018; June 2018; and July 2018. Flat at 2.1 (6+), Univision Radio regional Mexican KSCA is within 2.1 – 2.8 range (6+) for the 18th ratings period in a row; “Zona Mx 101.9” advances from #22 to a three-way tie at #20. Unchanged at #4, Entercom smooth AC KTWV was a collective +.7 in five straight months without a loss (4.1 – 4.4 – 4.4 – 4.7 – 4.8 – 4.8, 6+), but “94.7 The Wave” is now off a combined half-share in June and July (4.8 – 4.5 – 4.3, 6+). In six consecutive down or flat trends (4.9 – 4.9 – 4.7 – 4.5 – 4.5 – 4.3 – 4.2, 6+), iHeartMedia CHR KIIS “102.7 Kiss-FM” (flat at #5) is an overall -.7. Its format rival, Entercom’s KAMP, logs a 2.7 (6+) for the third sweep in a row as “97.1 Amp Radio” departs the top ten (#10 to #11. Flat at 2.3 (#20 to #19, 6+), Mt. Wilson FM Broadcasters’ KKGO “Go Country 105” is within 2.0 – 2.9 range (6+) for the 33rd time in succession; March 2018’s 2.0 is its lowest 6+-stat since January 2016 (2.0, as well). Hitting a 2.8 (November 2017, 6+) in its final days as classic rock KSWD “The Sound,” the Los Angeles frequency at 100.3 became Educational Media Foundation contemporary Christian KKLQ. Following the format change, it immediately slumped to 1.2 (December 2017, 6+). “Positive & Encouraging K-Love” didn’t reach a 1.0-share (6+) in the next seven sweeps (January 2018 – June 2018), including June’s .7; KKLQ disappears from print in July 2018. Spoken-Word Formats – Over and above logging a combined full-share gain via three consecutive positive spikes (2.0 – 2.2 – 2.4 – 3.0, 6+), Tribune Media news/talk WGN vaults back into the top twenty (#21 to a three-way tie at #14). When the Chicago White Sox flagship picked up two-tenths in May, it halted three successive decreases that accounted for a collective -1.3 (3.3 – 3.1 – 2.2 – 2.0, 6+). In the same vein, a March increase of three-tenths ended six straight down or flat sweeps that resulted in a collective -.7 (2.9 – 2.7 – 2.6 – 2.4 – 2.3 – 2.2 – 2.2, 6+). This is the fifth time in a row Entercom’s WBBM-AM (third to fifth) is without a gain for a collective -.7 (5.3 – 5.1 – 4.9 – 4.9 – 4.8 – 4.6, 6+). The all-news outlet was up by an overall eight-tenths in January and February (4.5 – 4.7 – 5.3, 6+) with February’s 5.3 its finest 6+-stat since March 2017’s 5.4. Off two-tenths in back-to-back reports (2.7 – 2.5 – 2.3, 6+), sports talk sibling WSCR “670 The Score” rebounded with a +1.3 in April and May (2.3 – 3.2 – 3.6, 6+), but the Chicago Cubs flagship slips by one-tenth in both June and in July (3.6 – 3.5 – 3.4, 6+), exiting the top ten (#9 to #11). “The Score” was a combined -2.8 between October 2017 – “Holiday” 2017 (4.9 – 3.6 – 2.1 – 2.1, 6+) and improved by six-tenths in January. Format competitor, ESPN-owned WMVP “ESPN Chicago 1000,” is without an increase for the sixth sweep in a row (1.6 – 1.5 – 1.5 – 1.4 – 1.3 – 1.3 – 1.2, #25 to #26, 6+). Up two-tenths to 1.7 (#24 to #22, 6+), Cumulus Media news/talk WLS-AM suspends four consecutive down or flat moves (2.0 – 2.0 – 1.8 – 1.7 – 1.5, 6+) that accounted for a one-half share loss. Immediately prior to that, WLS-AM registered seven straight up or flat ratings periods and was +.7 in that stretch (1.3 – 1.5 – 1.5 – 1.5 – 1.5 – 1.7 – 2.0 – 2.0, 6+). An overall +.8 in March and April (2.2 – 2.5 – 3.0, 6+), Chicago Public Media news/talk WBEZ is -.6 in three straight (modest) dips (3.0 – 2.8 – 2.5 – 2.4, flat at #20, 6+). Chicago Music Formats – Through May 2018, WLS-FM was an overall +1.6 in seven consecutive sweeps without a loss (2.7 – 3.0 – 3.0 – 3.1 – 3.4 – 3.5 – 3.8 – 4.3, 6+), but “94.7 Chicago’s Classic Hits” surrendered one-tenth in June. It roars back though with a +.7 in July to 4.9 (6+), leaping from sixth to second. The Cumulus Media-owned facility is tied for the runner-up slot with Hubbard’s WDRV “97.1 The Drive – Chicago’s Classic Rock,” which nearly doubles its 6+-stat (a combined +2.3) via seven straight up or flat trends (2.5 – 3.3 – 3.3 – 4.2 – 4.6 – 4.8 – 4.8 – 4.9, third to second, 6+). Up one-tenth in back-to-back ratings periods (5.9 – 6.0 – 6.1, 6+), iHeartMedia urban AC WVAZ is on top for the seventh month in a row. The +.1 in June by “V-103 Today’s R&B and Throwbacks” applied the brakes to four straight down or flat trends that produced a -.9 (6.8 – 6.6 – 6.1 – 6.1 – 5.9, 6+). No higher than 5.1 (6+) and no lower than 4.7 (6+) in each of the last six sweeps, Hubbard-owned hot AC WTMX “101.9 The Mix” (4.9 – 4.8, -.1, 6+) slips from second to fourth. After notching three (slight) increases in succession (3.1 – 3.3 – 3.4 – 3.5, 6+), iHeartMedia’s similarly-formatted WLIT “93.9 Lite FM” returns the overall gain of four-tenths in its entirety (3.1 – .4, 6+) and drops out of the top ten (#9 to #13). By gaining four-tenths (3.3 – 3.7, 6+), Venture Technologies Group adult contemporary WRME-LP “FM 87.7 Me TV” progresses from #13 to #9. It is within 3.3 – 3.7 range (6+) for the sixth month in a row (3.6 – 3.5 – 3.5 – 3.5 – 3.3 – 3.7, 6+). Seven-tenths behind WRME is Hubbard adult contemporary WSHE “100.3 SHE,” which is up or flat for the third consecutive month for a +.4 (2.6 – 2.7 – 3.0 – 3.0, #15 to #14, 6+). This is the 12th straight time that Entercom-owned WUSN (ninth to seventh) is within 3.0 – 3.9 range (3.5 – 3.9, +.4, 6+). “US-99 Chicago’s Hottest Country” more than doubles the 6+-stat of iHeartMedia’s WEBG “Big 95.5 – Chicago’s New Country” (1.9 – 1.7, -.2, #23, 6+). Spoken-Word Formats – Albeit down for the fourth time in a row for a collective -2.2 (8.9 – 8.4 – 8.1 – 7.1 – 6.7, 6+), Northern California Public Broadcasting news/talk KQED is on top for the seventh straight month. Finishing first and second, respectively, the past six reports are KQED and Entercom all-news KCBS-AM, which is locked on 5.5 (6+) in June and July after being frozen on 5.4 (6+) in April and May. In advance of posting a one-tenth gain in June, KCBS-AM had been down or flat the previous four sweeps for a net loss of eight-tenths (6.2 – 5.7 – 5.6 – 5.4 – 5.4, 6+). October 2017’s 6.8 was its strongest 6+-performance since February 2017 (6.8, as well). Not only does KSFO rack up its fourth successive increase for an overall +1.3 (2.1 – 2.3 – 2.7 – 3.0 – 3.4, , 6+), the Cumulus Media news/talker enters the top ten (#12 to #8). Prior to gaining two-tenths in March, KSFO was a combined -1.3 in five straight decreases, (3.4 – 3.0 – 2.4 – 2.2 – 2.2 – 2.1, 6+). Conversely, co-owned KGO is down or flat for the fourth successive sweep (2.0 – 1.8 – 1.8 – 1.7 – 1.7, 6+) but remains at #21. Trending 3.8 – 3.7 – 3.6 – 3.7 (6+) since April, co-owned San Francisco Giants flagship KNBR climbs from seventh to sixth; “The Sports Leader” gained nine-tenths in April. Before the June report, when it lost one-tenth, Entercom’s KGMZ “95.7 The Game” had been without a loss the previous nine ratings periods, nearly tripling (+1.7) its 6+-stat in that timeframe (1.0 – 1.2 – 1.4 – 1.4 – 1.5 – 1.7 – 2.1 – 2.1 – 2.3 – 2.7, 6+). In July, however, the key station of the Oakland A’s plummets by -1.1 (2.6 – 1.5, 6+), drifting from the top twenty (#15 to #24). San Francisco Music Formats – Not only does iHeartMedia’s KMEL post a gain of six-tenths (3.8 – 4.4, steady in fourth-place), “106.1 – #1 For Hip-Hop and R&B in the Bay Area”) has its finest 6+-showing since “Holiday” 2014 (4.4, as well). Talk about being consistent: Cumulus Media classic rocker KSAN records a 6+-share in the two-share range (2.0 – 2.9) for the 40th time in a row (2.4 – 2.9, +.5, #16 to #14, 6+). The last time “107.7 The Bone” reached 2.9 was December 2015. In addition to dropping one-half share (3.5 – 3.0, 6+), iHeartMedia hot AC KIOI “Star 101.3 – More Music, More Variety” exits the top ten (#9 to #13). Eight-tenths ahead of “Star” is its format rival, Entercom-owned KLLC “Alice @ 97.3,” which adds two-tenths to June’s +.3 (3.3 – 3.6 – 3.8, seventh to fifth, 6+). In four successive (modest) declines prior to June’s increase (4.1 – 3.7 – 3.6 – 3.5 – 3.3, 6+), KLLC was off by eight-tenths; the two hot ACs were tied at #8 in May. An overall +.6 via four straight up or flat trends (4.4 – 4.4 – 4.6 – 4.9 – 5.0, 6+), iHeartMedia adult contemporary KISQ “98.1 The Breeze” falters by two-tenths to 4.8 (6+) but remains in third-place. A loss of four-tenths sends Entercom’s similarly-formatted KOIT-FM from fourth to eighth; “96.5 Today’s Hits & Yesterday’s Favorites” has put up a February 2018 – July 2018 6+ topline of 3.7 – 3.7 – 3.8 – 3.9 – 3.8 – 3.4. Very steady March 2018 – July 2018 trending for iHeartMedia’s KYLD “Wild 94.9 – The Bay’s #1 Hit Music Station” is 3.0 – 3.1 – 3.0 – 3.1 – 3.3 (flat at #10, 6+), while co-owned 1980’s-based KOSF “iHeart 80s @ 103.7” gains four-tenths to 3.1 (#14 to #12, 6+). Entering the July sweep, its past six (6+) stats were 2.5 – 2.6 – 2.7 – 2.6 – 2.6 – 2.7. Returning to print after a lengthy hiatus are Entercom’s KUFX “98.5 K-Fox, The South Bay’s Classic Rock” (1.6 – 2.0, +.4, #18, 6+) and Empire Broadcasting-owned KRTY “Hot Country 95.3” (1.5 – 1.7, +.2, #21, 6+). Spoken-Word Formats – This marks the third time in a row that Entercom sports talk KRLD-FM slips by one-tenth (2.4 – 2.3 – 2.2 – 2.1, 6+), but “105.3 The Fan” carries on at #19. In advance of a +.5 in April, the Texas Rangers flagship posted five straight negative trends that resulted in a -1.2 (3.1 – 2.5 – 2.4 – 2.3 – 2.1 – 1.9, 6+). Off one-tenth as well in July is Cumulus Media’s similarly-formatted KTCK “The Ticket – All Sports, All The Time,” which is -1.3 since May (4.1 – 2.9 – 2.8, #14 to #15, 6+). The +1.2 (2.9 – 3.3 – 4.1, 6+) “The Ticket” racked up in April and May was fully erased in June. KTCK was stymied at 3.0 (6+) in December and “Holiday” 2017 but registered a +.5 in January, before dropping three-tenths in back-to-back sweeps (3.5 – 3.2 – 2.9, January – February – March, 6+). Elsewhere in this Texas market’s sports talk format, the eight most recent 6+-stats for ESPN’s KESN “103.3 ESPN Dallas” are 1.1 – 1.0 – .9 – 1.0 – 1.1 – 1.1 – 1.0 – .9 (#32 to #33, 6+). Notwithstanding that it is flat at 2.8 (#17 to #15, 6+), North Texas Public Broadcasting news/talk KERA posts a 6+-share in the two-share range for the 36th consecutive sweep. A collective -.7 through five straight months without an increase (2.8 – 2.6 – 2.6 – 2.4 – 2.1 – 2.1, 6+), Entercom news – talk hybrid KRLD-AM nonetheless climbs from #20 to #19. Going back to “Holiday” 2016, KRLD-AM is within a high of 2.8 and a low of 2.0. A loss of two-tenths in March ended at seven a consecutive string of up or flat trends that netted seven-tenths (2.1 – 2.1 – 2.2 – 2.4 – 2.4 – 2.5 – 2.7 – 2.8, 6+). It is tied at #19 with Cumulus Media’s WBAP “News Talk 820,” which was locked on 2.2 (6+) in April and May and is now frozen on 2.1 (6+) in June and July. Finishing at #34 and #5, respectively, are Salem Media Group-owned KSKY “660 AM The Answer” (flat at .7, 6+) and Cumulus Media’s KLIF-AM “570 News & Information” (.5, -.1, 6+), which had recorded a .6 (6+) the past three sweeps. Dallas Music Formats – Winning ways (that are now historic) continue for Cumulus Media’s KSCS, which is +1.3 in seven successive up or flat trends (3.9 – 4.3 – 4.3 – 4.3 – 4.5 – 4.6 – 4.7 – 5.2, 6+). Moreover, “96.3 New Country” reaches/crosses the five-share level (5.2, 6+) for the first time in its PPM history to inch up from third to second. It now leads co-owned/similarly-programmed KPLX “99.5 The Wolf” by +1.1 (4.2 – 4.1, -.1, flat at #6, 6+). Following a +1.5 via three positive spikes in a row (5.4 – 6.0 – 6.7 – 6.9, 6+), iHeartMedia-owned KHKS is a combined -1.4 in June and July (6.9 – 6.3 – 5.5, 6+). While “106.1 Kiss – Dallas/Fort Worth’s Hit Music” is the “Big D” pacesetter for the seventh straight month, its advantage over runner-up KSCS is just three-tenths. When “Kiss” reached #1 in January, it was the first time the mainstream CHR held the lead position since March 2017. Advancing from #17 to #15, Entercom-owned KVIL “Alt 103.7 – DFW’s New Alternative” is without a loss for the fourth sweep in a row for a +.4 (2.4 – 2.4 – 2.5 – 2.8 – 2.8, 6+), while classic hits-oldies cluster-mate KLUV “98.7 K-LUV” (fifth to fourth) is up or flat for the third straight time for a +.2 (4.4 – 4.5 – 4.5 – 4.6, 6+). Without a decrease for the third successive ratings period as well is Radio One rhythmic CHR KBFB “97.9 The Beat” (2.9 – 3.0 – 3.0 – 3.3, #12 to #11, 6+). In an up/down pattern that commenced in January and includes July’s -1.0, Univision Radio Spanish contemporary KDXX “Latino Mix” is trending 2.4 – 2.5 – 2.3 – 2.8 – 2.6 – 2.9 – 1.9 (#23, 6+). Up three-tenths each are KDXX regional Mexican sibling KLNO “Que Buena 94.1” (3.7 – 4.0, eighth to seventh, 6+) and Entercom’s similarly-programmed KMVK “La Grande 107.5” (2.1 – 2.4, #20 to #18, 6+). A collective +.9 in May and June (1.2 – 1.4 – 2.1, 6+), Educational Media Foundation contemporary Christian KYDA “Air 1 Positive Hits” returns two-thirds of that increase in July (1.5, -.6, 6+) and plummets from the top twenty (four-way tie at #20 to #27). In June, it reached the two-share level (2.1, 6+) for the first time since March 2017’s 2.0. Spoken-Word Formats – Continuing a March 2018 – July 2018 down/up pattern (3.4 – 3.3 – 3.9 – 3.8 – 4.1, 6+), iHeartMedia news/talk KTRH elevates from #13 to #11; “News Radio 740” improved by six-tenths in January. In advance of that particular gain, KTRH was down or flat the previous four monthlies for an overall -1.4 (3.9 – 3.3 – 3.2 – 3.0 – 2.5, 6+). Regaining half the four-tenths it dropped in June (3.2 – 3.4, +.2, 6+), University of Houston news/talk KUHF moves from #16 to #15. Mirroring KTRH, KUHF was +.6 in January. Among the market’s sports talk competitors, iHeartMedia-owned Houston Astros flagship KBME “Sports Talk 790” is trending 1.3 – 1.2 – 1.2 – 1.3 (unchanged at #22, 6+); Entercom’s KILT-AM “Sports Radio 610” returns half of June’s +.2 (1.0 – .9, -.1, #24, 6+); and Gow Communications’ KFNC “ESPN 97.5” is flat at .6 (#27, 6+). Houston Music Formats – In addition to registering its seventh straight up or flat trend for an overall +1.4 dating back to “Holiday” 2017 (4.3 – 4.6 – 4.8 – 4.8 – 4.8 – 4.9 – 5.2 – 5.7, 6+), Cox Media Group classic rock KGLK “Houston’s Eagle” marches from third to a second-place tie. Moreover, this (5.7) is its strongest 6+-performance since 5.9 in October 2017. As the result of three straight upticks netting eight-tenths (4.5 – 4.6 – 4.9 – 5.3, 6+), Entercom adult hits KKHH “95.7 The Spot” leaps from seventh to fourth. Debuting at #29 with a .5 (6+) is University of Houston-owned classical KUHF-HD2. The topline (6+) April – May – June – July trending for KODA is 7.0 – 7.4 – 7.0 – 7.3, as the iHeartMedia adult contemporary facility is #1 for the third month in a row. Having finished first in four successive sweeps, “Sunny 99.1” segued to second in March, but then answered a -1.1 in March with an April +.8 to return to the top spot. Finishing second in October and November, KODA was -5.4 in January but gained two-tenths in February. Its 12.5 in “Holiday” 2017 is its strongest 6+-stat since “Holiday” 2016’s 10.3 and the first time any Houston station reached double-digits (6+) since that ratings period. After improving by two-tenths in May (7.0 – 7.2, 6+), Radio One urban AC KMJQ stumbles by a cumulative -1.5 in June and July (7.2 – 6.5 – 5.7, 6+); “Majic 102.1 – The People’s Station” remains in the runner-up slot, but is tied there with aforementioned KGLK. Stuck on 7.0 (6+) in January and February, “Majic” dropped to 6.8 (6+) in March; “Majic” and KODA were tied for #1 in April. A combined +1.5 in March and April (4.9 – 6.0 – 6.4, 6+), Cox Media Group’s KKBQ is now -1.2 in three straight down or flat trends (6.4 – 5.7 – 5.2 – 5.2, 6+), with “Country 93-Q” slipping from third to fifth. At the same time, Entercom’s KILT-FM “New Country 100.3 The Bull” is +1.0 in June and July (3.5 – 4.1 – 4.5, 6+), climbing from tenth to ninth. Prior to June’s +.6, “The Bull” had three straight declines for a cumulative -.6 (4.1 – 4.0 – 3.7 – 3.5, 6+). Six straight sweeps without an increase (5.2 – 5.0 – 4.3 – 3.7 – 3.7 – 3.6 – 3.3, 6+), cause KSBJ Educational Foundation’s KSBJ “89.3 Contemporary Christian Music – God Listens” (#15 to #16) to erode by a cumulative -1.9. Topline (6+) March 2018 – July 2018 stats for Entercom Spanish contemporary KLOL “Mega 101” (#13 to #14) are 3.7 – 3.8 – 3.9 – 3.8 – 3.8, while in that same stretch, Univision Radio’s similarly-formatted KAMA “Latino Mix” (#19 to #17) is equally consistent at 2.7 – 2.7 – 2.6 – 2.7 – 2.8 (6+). Along the same lines, KAMA Spanish adult hits sibling KOVE “Amor 106.5” is trending 2.9 – 2.8 – 2.9 – 2.8 (flat at #17, 6+). Spoken-Word Formats – Without an increase for the fifth sweep in succession for an overall -1.4 (4.5 – 4.5 – 4.2 – 4.0 – 3.8 – 3.1, 6+), City of Atlanta Board of Education news/talk WABE drifts from #11 to #15. Albeit down two-tenths to 7.6 (6+), Cox Media Group news/talk WSB-AM is on top for the 32nd consecutive time. When WSB-AM gained three-tenths this time last month, it halted three consecutive negative moves that accounted for a -2.7 (10.2 – 9.4 – 8.4 – 7.7 – 7.5, 6+). WSB-AM, which was +1.6 in January, notched three straight increases for a collective +1.6 (8.6 – 8.9 – 9.9 – 10.2, 6+) but then was a combined -1.6 in three consecutive drops (10.2 – 10.0 – 9.1 – 8.6, October – November – December – “Holiday” 2017, 6+). 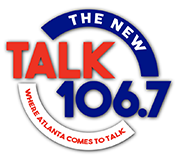 Tacking on two-tenths to June’s +.3 (1.8 – 2.1 – 2.3, 6+), Cumulus Media’s WYAY “106.6 Where Atlanta Comes to Talk” is steady at #18. Prior to April’s 2.0, WYAY recorded a 1.8 (6+) in January, February, and March. A combined -1.1 in May and June (3.3 – 2.7 – 2.2, 6+) following an April increase of seven-tenths, Entercom sports talk WZGC “92.9 The Game” picks up three-tenths to 2.5 (6+) and remains at #17. Immediately in advance of a -1.1 in February, “The Game” was a combined +.7 in three straight gains (3.0 – 3.4 – 3.5 – 3.7, 6+). A setback of two-tenths to 1.8 (6+) by Dickey Broadcasting’s WCNN “Sports Radio The Fan” pulls the plug on seven successive sweeps without a decrease that netted eight-tenths (1.2 – 1.2 – 1.2 – 1.3 – 1.5 – 1.7 – 1.8 – 2.0 – 2.0, 6+), but the AM flagship of the Atlanta Braves continues at #19. April 2018 – July 2018 stats for Georgia State University news/talk WRAS (#26) are .6 – .7 – .6 – .8 (6+). Atlanta Music Formats – In addition to logging three straight up or flat trends for a cumulative gain of seven-tenths (3.4 – 3.4 – 3.5 – 4.1, 6+), iHeartMedia CHR WWPW “Power 96.1 Atlanta’s #1 Hit Music Station” vaults into the top ten (#14 to #9) with its best 6+-stat (4.1) since February’s 4.3. It now trails Cumulus Media’s similarly-formatted WWWQ “Q-100, Atlanta’s New Hits” (4.0 – 4.2, +.2, ninth to eighth, 6+) by just one-tenth. At the same time that Entercom hot AC WSTR “Star 94.1 – Today’s Hits” is up or flat for the third time in a row for a collective +1.4 (2.5 – 3.6 – 3.6 – 3.9, #13 to #12, 6+), Cox Media Group adult contemporary WSB-FM “B-98.5” is without an increase in the same timeframe for a loss of three-tenths (5.9 – 5.8 – 5.6 – 5.6, 6+) and carries on in fourth-place. Improving by one-tenth each are iHeartMedia’s country WUBL “94.9 The Bull” (3.9 – 4.0, steady at #10, 6+) and Cumulus Media-owned WKHX “Kicks 101.5 – Atlanta’s #1 For Country Hits,” which has its best 6+-showing (3.9) since August 2017 (3.9, as well), yet backslides from #11 to #12. A one-tenth May setback by “The Bull” ended four increases in a row for an overall gain of six-tenths (4.1 – 4.2 – 4.5 – 4.6 – 4.7, 6+); it was -.7 in June. The market’s two urban contemporary outlets are off a combined one-half share. Specifically, Entercom’s WVEE “V-103 The People’s Station” falters by four-tenths (7.0 – 6.6, 6+) but stays at #2, while Radio One-owned WHTA “Hot 107.9,” which had been up six-tenths in three straight upticks (4.1 – 4.2 – 4.6 – 4.7, 6+), drops one-tenth to 4.6, staying at #7 (6+). Before losing one-tenth in June, WVEE logged four sweeps in a row without a loss for a combined +1.3 (5.8 – 5.8 – 6.3 – 6.7 – 7.1, 6+); May’s 7.1 is its best 6+-performance in more than two years (7.3, April 2016). It is a somewhat similar situation with urban AC here (the format is a combined -.8 compared to June), as Radio One’s WAMJ “Majic – The Real Sound of Atlanta” sputters by one-half share (5.6 – 5.1, fourth to fifth, 6+), while Cox Media Group’s WALR “Kiss 104.1 – Atlanta’s R&B” drops three-tenths (4.3 – 4.0, eighth to tenth, 6+). After three negative trends in succession for an overall -.9 (4.5 – 4.3 – 4.1 – 3.6, 6+), “Kiss” wiped away seven-tenths of the loss in June. Having logged seven straight up or flat moves (1.3 – 1.3 – 1.5 – 1.5 – 1.8 – 1.8 – 1.8 – 2.1, 6+) and finishing #19 in May, Cox Media Group urban contemporary WSTR-HD3 is unlisted in June and July. Spoken-Word Formats – Following gains of one-tenth in May and June, Entercom’s WPHT breaks out a one-half share increase in July (1.5 – 1.6 – 1.7 – 2.2, 6+) to progress from #20 to #17. “Talk Radio 1210” was stuck on 1.8 (6+) in “Holiday” 2017 and January 2018 and then on 1.9 (6+) in February and March, before dropping to 1.5 in April. While flat at #7, co-owned sports talk WIP is a collective -1.7 in three straight decreases (6.9 – 6.1 – 5.6 – 5.2, 6+). The Phillies flagship was an overall -1.1 (December and “Holiday” 2017); +2.6 (January 2018); -.8 (February); -2.9 (March); +1.1 (April); -.8 (May); and -.5 (June). Dropping from #18 to #19, its format foe, Beasley Media Group’s WPEN-FM, is without a gain for the third time in succession for an overall decline of eight-tenths (2.8 – 2.3 – 2.0 – 2.0, 6+); “97.5 The Fanatic” was +.9 in January. In four consecutive down or flat trends (6.0 – 5.0 – 4.7 – 4.5 – 4.5, 6+), Entercom all-news KYW (flat at #8) is -1.5. An increase of nine-tenths in March (5.1 – 6.0, 6+) gave KYW its strongest 6+-showing in three years (6.1, March 2015), but it then surrendered one full-share in April; KYW improved by +1.0 in January. Public news/talk WHYY posts its third successive negative move for an overall -1.1 (4.4 – 3.7 – 3.6 – 3.3, 6+) and departs the top ten (#10 to #12). It was up one full-share in January, but off six-tenths in “Holiday” 2017. Unchanged at #21, Townsquare Media news/talk WKXW “New Jersey 101.5” falters by two-tenths (1.6 – 1.4, 6+). Philadelphia Music Formats – It is truly a benchmark sweep for Entercom classic hits-oldies WOGL “98.1 – Nobody Plays More 80s,” which records its highest-ever 6+-stat in the PPM-era (8.2); is #1 for the first time since August 2017; and registers its sixth straight gain for a combined +2.9 (5.3 – 6.3 – 6.9 – 7.0 – 7.2 – 7.7 – 8.2, 6+). At #1, it displaces a station about to be its cluster-mate, adult contemporary WBEB “Today’s 101.1 More FM,” which was on top the past four months. Regressing by seven-tenths to 7.8, its lowest 6+-showing since November 2017 (7.8, as well), WBEB segues to the runner-up slot. As a result of five straight increases before January’s -8.7, “Today’s 101.1 More FM” was a collective +10.3 (6.7 – 7.2 – 7.6 – 7.8 – 12.8 – 17.0, 6+). In “Holiday” 2017, WBEB achieved its most potent 6+-share since 17.9 in “Holiday” 2016. Before officially closing on its $57.5 million purchase of WBEB from Jerry Lee Radio, Entercom took over operation of the station last Thursday (9/9) under a Time Brokerage Agreement (TBA). Wiping away June’s one-half share loss with a July gain of six-tenths (5.8 – 6.4, 6+), iHeartMedia-owned WDAS-FM advances from fifth to fourth. Immediately prior to June’s -.6, “Philly’s Best R&B and Throwbacks” was an overall +.8 in three straight positive spikes (5.5 – 5.8 – 6.0 – 6.3, 6+). This (6.4) is its highest 6+-share since January’s 6.6. Without a loss for the seventh straight month for an overall +2.2 (3.6 – 4.2 – 4.3 – 4.6 – 4.9 – 5.7 – 5.7 – 5.8, 6+), WXTU advances from sixth to fifth. Previous to the May sweep, the last time “92.5 Philadelphia’s Country Station” reached the five-share level (6+) was in August 2016 (5.3). After three straight flat or up trends that yielded six-tenths (5.5 – 5.5 – 5.9 – 6.1, 6+), Beasley Media Group’s WMMR “93.3 Everything That Rocks” surrenders the entire gain and one-tenth more (5.4, -.7, fourth to sixth, 6+). Down one full-share in 16 straight down or flat sweeps (1.9 – 1.7 – 1.6 – 1.6 – 1.6 – 1.5 – 1.4 – 1.4 – 1.4 – 1.2 – 1.0 – 1.0 – 1.0 – 1.0 – 1.0 – .9 – .9, 6+), Radio One gospel WPPZ “Praise 107.9 – Philadelphia’s Inspiration Station” actually improves from #26 to #24. Spoken-Word Formats – It is a bit of a rollercoaster ride lately for Entercom’s WFAN “Sports Radio,” which was -1.1 in February; a collective +1.8 in April and May (2.9 – 4.0 – 4.7, 6+); -.5 in June; and now the New York Yankees’ flagship is +.7 in July (4.2 – 4.9, sixth to fourth, 6+). Meanwhile, the key station of the New York Mets – iHeartMedia news/talk WOR “710 The Voice of New York” – is -1.2 in three straight down or flat trends (3.1 – 2.3 – 1.9 – 1.9, 6+) and moves from #21 to #22. In advance of surrendering three-tenths in March, WOR was an overall +.8 in three straight gains (2.0 – 2.1 – 2.6 – 2.8, 6+). Simply by remaining flat at 2.5 (6+), Entercom all-news WCBS-AM advances from #16 to #14, where it catches co-owned/similarly-formatted WINS (2.8 – 2.5, #13 to #14, 6+). WCBS-AM gained two-tenths in January, halting four straight down or flat trends for an overall loss of one full-share (3.8 – 3.7 – 3.0 – 2.8 – 2.8, 6+). In March, it recaptured the four-tenths it dropped in February. This marks the third straight time WINS shows a month-to-month fluctuation of three-tenths: +.3 (May); -.3 (June) and -.3 (July). After five consecutive upticks for a +1.2, which more than doubled its 6+-share (1.1 – 1.2 – 1.3 – 1.8 – 2.0 – 2.3, 6+), WEPN “98.7 ESPN New York” is off one-half share in June and July (2.3 – 2.0 – 1.8, 6+) and departs the top twenty. Trending 1.6 – 1.9 – 1.6 – 1.7 – 1.5 – 1.5 (February 2018 – July 2018, 6+), WNYC Broadcasting Foundation news/talk WNYC-FM moves from #24 to #25; meanwhile, Cumulus Media news/talk WABC (#25 to #26) is without an increase for the fourth consecutive month for a loss of three-tenths (1.5 – 1.4 – 1.4 – 1.4 – 1.2, , 6+). Long Island Music Formats – It is an extremely tight race at the top, as the first five Nassau-Suffolk July 2018 finishers are separated by just two-tenths of a share. Included in that pack is the market’s new number one (up from second-place in June), Cox Media Group CHR WBLI “Long Island’s #1 For All the Hits,” a collective +1.4 through four straight improvements (3.7 – 4.0 – 4.4 – 5.0 – 5.1, 6+). This (5.1) is its strongest 6+-performance since September 2017’s 5.2. Format rival, iHeartMedia New York City’s WHTZ “Z-100,” is flat or down (slightly) for the third straight time and slides from second to fourth (5.1 – 5.0 – 5.0 – 4.9, 6+). Displaced from the top spot after nine straight months there and taking WBLI’s place at #2 is Connoisseur Media hot AC WALK-FM “Real Variety 97.5,” which posts its seventh successive sweep without an increase (12.6 – 7.4 – 7.4 – 7.0 – 6.1 – 5.8 – 5.1 – 5.0, 6+) for an overall -7.6. “Real Variety” was a cumulative +7.2 in October – November – December – “Holiday” 2017 (5.4 – 6.7 – 8.7 – 12.6, 6+). Off one-half share, owing to three straight minor dips (2.3 – 2.0 – 1.9 – 1.8, 6+), Entercom hot AC WNEW-FM “NEW 102.7” answers with a +.6 to 2.4 (6+) and returns to the top twenty (#22 to #17). The format gains another three-tenths in July as Cumulus Media-owned WPLJ “New York’s 95.5 PLJ,” which was tied with WNEW-FM in June, improves 1.8 – 2.1 (#19, 6+). Having been up or flat the past three months for a +.7 (2.3 – 2.4 – 2.4 – 3.0, 6+), Connoisseur Media’s WWSK “94.3 The Shark – Everything That Rocks” slips one-tenth to 2.9 (6+) but stays at #12. Within 2.0 – 2.9 territory (6+) for the 45th consecutive ratings period, Emmis rhythmic CHR WQHT “Hot 97” (#13 to #14) drops three-tenths (2.8 – 2.5, 6+). In five straight down or flat trends (4.9 – 4.4 – 4.3 – 4.3 – 3.8 – 3.7, 6+), Entercom classic hits-oldies WCBS-FM “101.1 New York’s Greatest Hits” is a collective -1.2 (eighth to ninth). More than a dozen stations that appeared in the June 2018 report have vanished from print in this sweep. With their (6+) June 2018 Long Island stat in parentheses, these are six notable examples that had at least a .6 (6+) in June 2018 but are now unlisted: Spanish Broadcasting System Spanish tropical WSKQ (1.3); co-owned Spanish contemporary WPAT (1.0); Educational Media Foundation contemporary Christian WKLV (.9); Univision Radio Spanish contemporary WXNY (.8); New York Public Radio classical WQXR (.7); and Fordham University alternative WFUV (.6). Spoken-Word Formats – Nearly doubling its 6+-stat in the last two monthlies (.9 – 1.1 – 1.7, 6+), San Bernardino Community College news/talk KVCR progresses from #13 to #11. In advance of the February sweep, KVCR was +.4 via three minor upticks in a row (.9 – 1.0 – 1.1 – 1.3, 6+). Notwithstanding its very steady Inland Empire November 2017 – July 2018 topline of .4 – .4 – .3 – .4 – .4 – .4 – .3 – .5 – .5 – .4 (6+), Pasadena City College news/talk KPCC “The Voice of Southern California” slips from #17 to #18. Debuting at #22 with a .2 (6+) is iHeartMedia news talk KKDD “1290 News Talk IE.” Part of May’s four-way logjam at #20 with a .3 (6+), co-owned KPWK “Fox Sports Radio 1350 AM” (formerly KUBE) disappeared from print in June, but resurfaces in July with a .2 (#22, 6+). Los Angeles Angels-owned (LAA 1, LLC) and similarly-formatted KLAA “Angels Radio AM 830” is unlisted for the sixth month in a row. Riverside Music Formats – As a result of being a collective +1.5 in June and July (3.4 – 4.1 – 4.9), iHeartMedia rhythmic CHR KGGI “99.1 Riverside’s Hottest Hit Music” elevates from fourth to third. Quadrupling its 6+-share (.2 – .8, 6+) Lazer Broadcasting’s KCAL-AM La Mexicana 1410 vaults from #20 to #14. Regional Mexican sibling KXRS “Radio Lazer” (#20 to #17) is in a repetitive cycle of .2 – .5 – .2 – .5 ( 6+), while co-owned/similarly formatted KXSB (also using the “Radio Lazer” handle) is without a gain for the third straight month (.7 – .6 – .6 – .4, #16 to #18, 6+). Not only does Entravision’s KLYY repeat at #1, “Jose” is +2.3 in three straight positive spikes (4.6 – 6.4 – 6.5 – 6.9, 6+). This follows five sweeps in succession without an increase for an overall -3.0 (7.6 – 7.3 – 5.8 – 5.8 – 5.0 – 4.6, 6+). June 2018 marked the first time “Jose” was in the lead position since “Holiday” 2017 when it scored a 7.3 (6+). Replaced by “Jose” in June after a five-month run at #1 – Anaheim Broadcasting classic hits-oldies KOLA – improves by three-tenths to 6.6 (6+) and duplicates its second-place finish. The +.3 ends four downward trends in succession that generated a -2.1 (8.4 – 7.1 – 6.7 – 6.5 – 6.3, 6+). Similarly, January’s +1.8 applied the brakes to three straight decreases that accounted for a -2.0 (7.5 – 6.0 – 5.8 – 5.5, 6+). Four negative moves in a row by Univision Radio regional Mexican KSCA “Zona Mx 101.9” (ninth to tenth) account for a collective -1.8 (3.8 – 3.7 – 3.3 – 2.6 – 2.0, 6+). Off by six-tenths in July as well is Entercom country outlet KFRG, which carries on in third-place (5.5 – 4.9, 6+). When “K-Frog” lost four-tenths in June, it snapped at four a consecutive string of increases that netted an overall +1.3 (4.6 – 4.9 – 5.4 – 5.8 – 5.9, 6+). While steady at #5, Univision Radio Spanish contemporary KLVE “107.5 K-Love” posts its third straight Riverside decrease for an overall -1.7 (5.3 – 4.9 – 3.9 – 3.6, 6+). For the third time in the last four sweeps, All-Pro Broadcasting adult contemporary KATY “101.3 The Mix” (#15 – #16) logs a .6 (.6 – .6 – .7. – .6, 6+). Spoken-Word Formats – For the past six San Jose sweeps (January 2018 – June 2018), Northern California Public Broadcasting news/talk KQED and Entercom’s all-news KCBS-AM have finished first and second, respectively. That changes in July 2018, however, as KQED (7.5 – 6.5, -1.0, 6+) drops to second and KCBS-AM (7.2 – 6.4, -.8, 6+) shifts to third. This (6.5) is the lowest 6+-stat since June 2017’s 6.1 for KQED, which rebounded from a combined -1.9 in April and May (8.8 – 8.2 – 6.9, 6+) with a June increase of six-tenths. When KQED lost six-tenths in “Holiday” 2017, it shifted to #2, following five successive sweeps on top; it was +1.0 in January. A setback of one-tenth in December halted three consecutive gains that produced an overall +1.3 (6.9 – 7.3 – 8.0 – 8.2, 6+). Meanwhile, KCBS-AM’s -.8 pulls the plug on four consecutive up or flat trends that netted +1.4 (5.8 – 5.8 – 6.3 – 6.4 – 7.2, 6+) and its strongest 6+ (San Jose) showing since November 2017 (7.2, as well). In the Cumulus Media cluster, sports talk KNBR “The Sports Leader is a cumulative -1.0 via three decreases in succession (4.6 – 4.3 – 3.9 – 3.6, 6+) and segues from eighth to tenth, with its lowest 6+-stat (3.6) since 3.0 in March. The San Francisco Giants flagship posted a +1.6 in April, as it reached the four-share level in San Jose (6+) for the first time since May 2017’s 4.2. Without a loss the past five months for an overall +1.0 (1.2 – 1.5 – 1.9 – 1.9 – 2.0 – 2.2 – 2.2, 6+), co-owned news/talk KSFO drops two-tenths to 2.0 (6+), slipping from #19 to #20. A different streak concludes for sibling KGO, which adds two-tenths (1.9, flat at #22) to pause four successive downward sweeps for a -1.4 (3.1 – 2.9 – 2.1 – 2.0 – 1.7, 6+); KGO was a combined +.7 in January and February (2.4 – 2.8 – 3.1, 6+). San Jose Music Formats – Over and above hauling out a robust +1.5 (5.2 – 6.7, 6+), Entercom-owned KUFX “98.5 K-Fox, The South Bay’s Classic Rock” jumps from fourth to first. By way of perspective, its July 2018 6.7 more than doubles October 2017’s 6+-share (3.2). Format rival – Cumulus Media’s KSAN “107.7 The Bone” is off three-tenths (2.3 – 2.0, #17 to #20, 6+). Four straight negative trends by iHeartMedia adult contemporary KISQ produced a loss of nine-tenths (4.5 – 4.4 – 4.0 – 3.7 – 3.6, 6+), but “98.1 The Breeze” rebounds with a gain of seven-tenths to 4.3 (ninth to eighth, 6+). Following June’s massive -1.2, (4.2 – 3.0, 6+), Entercom’s similarly-formatted KOIT-FM “96.5 Today’s Hits & Yesterday’s Favorites” regains one-tenth to 3.1 (6+) and carries on at #12. Good news continues for Empire Broadcasting’s KRTY, which records its fourth gain in a row for an overall +1.1 (4.0 – 4.1 – 4.2 – 4.5 – 5.1, 6+) as “San Jose Hot Country 95.3” progresses from seventh to sixth. With exactly the same (6+) share it had when it began its down/up pattern in December 2017 (2.2 – 1.7 – 2.1 – 1.9 – 2.2 – 1.9 – 2.0 – 1.7 – 2.2, 6+), iHeartMedia’s KOSF “iHeart80s @ 103.7” cracks the top twenty (#22 to #18). In three straight positive spikes, Univision Radio Spanish adult hits KBRG was an overall +1.9 (3.7 – 4.5 – 5.3 – 5.6, 6+), but “Amor 100.3” surrenders roughly 20% of that increase (5.2, -.4, 6+), slipping from third to fifth. bit analogous to what is highlighted in Long Island (see above), seven stations with at least a 1.2 (6+) in the June 2018 ratings period have disappeared from print in this report. With their (6+) June 2018 San Jose stat in parentheses, the seven outlets falling in that category are: Entercom rhythmic hot AC KRBQ (1.9); University of Southern California classical KDFC (1.7); Entercom alternative KITS (1.6); public contemporary Christian KLVS (1.5); Entercom sports talk KGMZ (1.4); Entercom urban AC KBLX (1.2); and Spanish Broadcasting System regional Mexican KRZZ (1.2). Spoken-Word Formats – A gain of four-tenths for the second straight time (6.0 – 6.4 – 6.8, 6+) propels WKXW from the runner-up slot to #1. The Townsquare Media news/talker was on top four ratings periods in succession before segueing to #2 in May. “New Jersey 101.5” was a combined -2.1 in April and May (8.1 – 7.3 – 6.0, 6+) and posted a +.9 in January to advance from second to first with its strongest 6+-stat since April 2016’s 8.5. Steady at #5, Entercom sports talk WFAN slips by one-tenth in both June and July (4.4 – 4.3 – 4.2, 6+). June’s one-tenth setback halted three straight positive spikes that netted a +1.1 (3.3 – 3.4 – 4.1 – 4.4, 6+). Four successive losses by WFAN accounted for a -1.9 (5.2 – 5.0 – 4.2 – 4.1 – 3.3, 6+), but immediately prior to that, the New York Yankees flagship was +1.4 via three straight increases (3.8 – 4.3 – 5.1 – 5.2, 6+). The eight most recent topline 6+ stats for sports talk WEPN “98.7 ESPN New York” (flat at #21) are: 1.6 – 1.9 – 2.0 – 1.7 – 2.0 – 2.1 – 1.7 – 1.9. In five straight losses (3.4 – 2.6 – 2.5 – 2.2 – 1.9 – 1.8, 6+), WNYC Broadcasting Foundation’s WNYC-FM has lost nearly 50% of its 6+ share (-1.6) and departs the top twenty (#20 to #22). Off a collective six-tenths in May and June (2.3 – 1.8 – 1.7, 6+), iHeartMedia news/talk and New York Mets flagship WOR makes up half the loss with a +.3 to 2.0 and returns to the top twenty at #20. Locked on 1.1 (6+) in March and April, Entercom all-news WINS records a 1.7 (#23, 6+) for the third straight time. It is one-tenth ahead of Cumulus Media news/talk WABC (#24, 6+), whose January 2018 – July 2018 6+ topline is: 1.5 – 1.6 – 1.4 – 1.5 – 1.4 – 1.7 – 1.6. Middlesex Music Formats – On a roll in this New Jersey market, Univision Radio Spanish contemporary WXNY “X-96.3” practically triples its 6+-share (+2.6) via seven up or flat trends (1.4 – 1.5 – 1.5 – 1.9 – 2.3 – 2.3 – 2.7 – 4.0, 6+) and catapults from #16 all the way to #7. Within three-share range (6+) in each of the past 13 sweeps, Emmis rhythmic CHR WQHT “Hot 97” gains one-half share (3.3 – 3.8, 6+) to jump from #13 to #10. An overall +1.2 in three consecutive up or flat reports (5.6 – 5.8 – 5.8 – 6.8, 6+), co-owned urban AC WBLS “107.5 #1 For R&B” forfeits all but one-tenth of that increase (5.7, – 1.1, 6+) and segues from first to second. The station it supplanted at #1 in June, iHeartMedia adult contemporary WLTW, collapses by -1.3 (6.3 – 5.0, 6+) but manages to stay in third-place. When “106.7 Lite FM” gained one-tenth in June, it applied the brakes to five straight down or flat trends that accounted for an overall -5.3 (11.5 – 7.4 – 6.9 – 6.7 – 6.7 – 6.2, 6+). In addition to recording its fourth decrease in a row for a -1.8 (5.5 – 4.9 – 4.7 – 3.8 – 3.7, 6+), Entercom classic hits-oldies WCBS-FM “101.1 New York’s Greatest Hits” exits the top ten (#10 to #12). Continuing the theme set in Long Island and San Jose (see above), seven stations that registered at least a one-half share (6+) in June 2018 are unlisted in July 2018. With their (6+) June 2018 Middlesex-Somerset-Union stat in parentheses, these seven outlets are: Entercom news WCBS-AM (1.5); Press Communications country WKMK (1.2); New York Public Radio classical WQXR (.9); Press Communications rock WWZY (.7); Univision Radio Spanish news/talk WADO (.7); Townsquare Media hot AC WJLK (.5); and Newark Public Radio jazz WBGO (.5).